How much thread length will I need on the tie rods I am ordering? Unlike hex bolts, lag screws, and structural bolts, there is no standard thread length for tie rods. A detailer or engineer may specify the thread length for tie rods, but it is not uncommon for the thread length to be left unspecified. 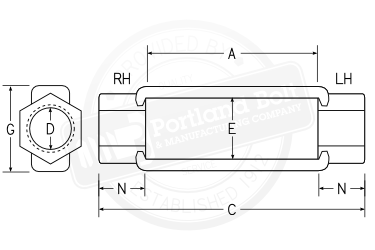 When thread lengths are not specified, Portland Bolt will determine the thread length in order to provide the potential for full engagement into the turnbuckles and clevis ends. Tie rods, also referred to as sag rods or tension rods, typically consist of a threaded rod with reverse thread on the ends that are assembled with matching clevises. Another common tie rod configuration may include a turnbuckle in the center. Both configurations are shown in the illustration below. 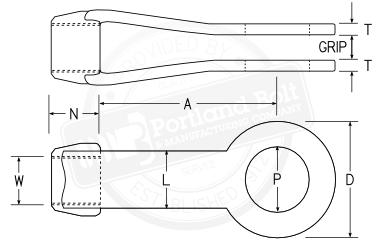 Portland Bolt may choose to round the thread length up to the nearest ½” increment. In the example above, Portland Bolt may choose to thread the ¾” diameter rods with 5” of thread on each end so full clevis engagement can be achieved. Clevis thread lengths will always meet or exceed the amount of thread required to fully engage into 6” turnbuckle. However, for longer turnbuckles, the thread length may need to be longer for the turnbuckle ends in order to allow for complete engagement. In the examples listed above for clevis and turnbuckle thread length, the turnbuckle end would actually require more thread than the clevis end in order to allow for complete engagement.